Move Mining and Move Mining Next Gen will open for the new season of entries on Monday, September 9. The contests will be open for entries through Monday, November 18. There is more information to come, but it’s not too early to start thinking about your concept ideas to improve the perception of mining. Be sure to enter early to maximize votes for People’s Choice. 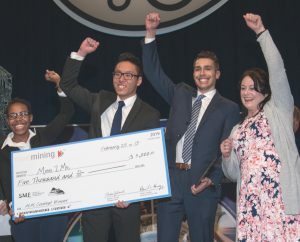 Meet this season’s winners below, and go to www.MoveMining.org and www.MoveMiningNextGen.org to learn more about the contests. Encourage your children’s and grandchildren’s teachers to have their students enter Move Mining Next Gen for the chance to win cash prizes, and also don’t forget to have your own children enter. Give students a chance to show the importance of minerals in their daily life, and share it with the world! Kamille Bernal from Morenci, AZ interviews James Tabinski from FMI Morenci Mine in a winning video from the 2017-2018 Move Mining Next Gen competition. 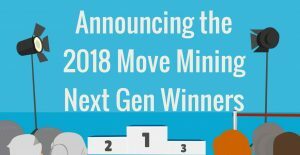 MEET THE 2018-2019 MOVE MINING NEXT GEN WINNERS! 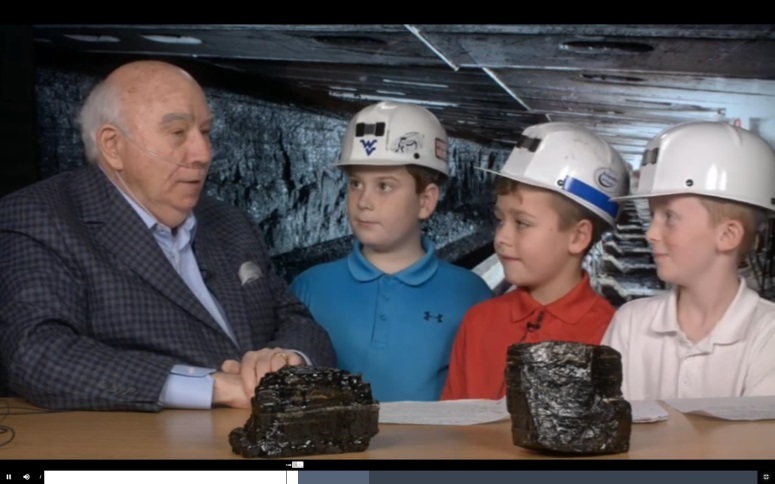 The winner of the Best in Grades K-5 $250 Prize is: Team Let’s Learn About Coal with Maddox, Carson & Evan by Evan Murray (OH) and friends Carson Sauvageot (OH) and Maddox Ochap (WV). The winner of the Best in Grades 6-8 $250 Prize is: Team The Clever Copper Shopper by Madison Husted (WI). The winner of the Best in Grades 9-12 $250 Prize is: Team Mara—Iron Mining by Mara Bernstein (MN). The winner of the People’s Choice Award $500 Prize, with 1,308 votes, is: Team Mining Rocks by Blake Austin and Chase Landon Butterfield (MN). 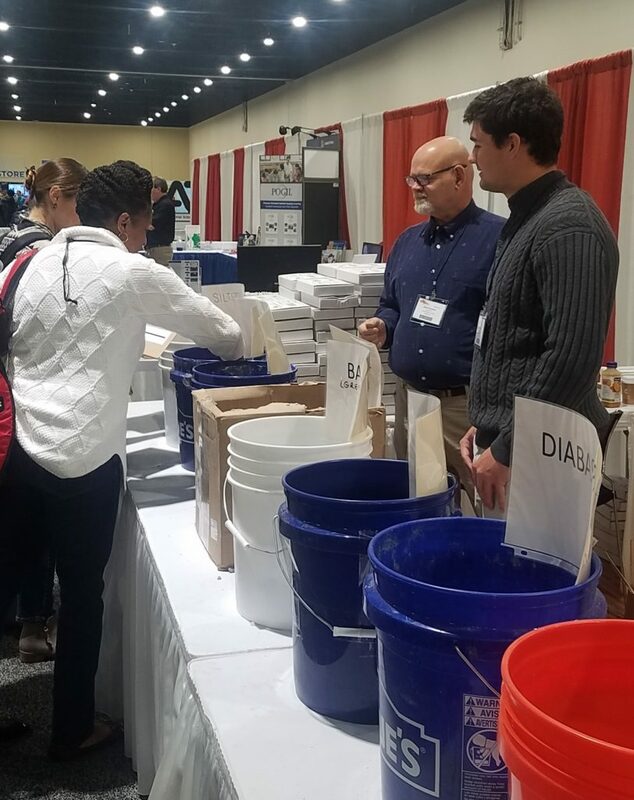 The NTSA area conference in Charlotte, North Carolina Nov. 15-17, 2018 was a great success! Dr. C. Dale Elifrits and Kathy Elifrits graciously funded boxes and printing costs for the event. Luck Stone provided samples, use of vehicles and dedicated volunteers to make it happen. Katie Kosloski orchestrated this effort, as she did in National Harbor, and she was accompanied by Keith Myers, Alicia Brooks and Amanda Powers. Luck Stone, Blaschak Coal Corp, Freeport McMoRan, New Enterprise Stone & Lime Co., Oceana Gold, Boxley, Frazier Quarry, Detroit Salt Company and Vulcan all contributed rock and mineral samples for the teacher kits. In all, 1,000 teacher boxes were distributed to more than 600 teachers from 25 states, Canada and the Virgin Islands. Volunteers Mark Craynon and Shane Gardner answer teachers’ questions about the mineral samples. 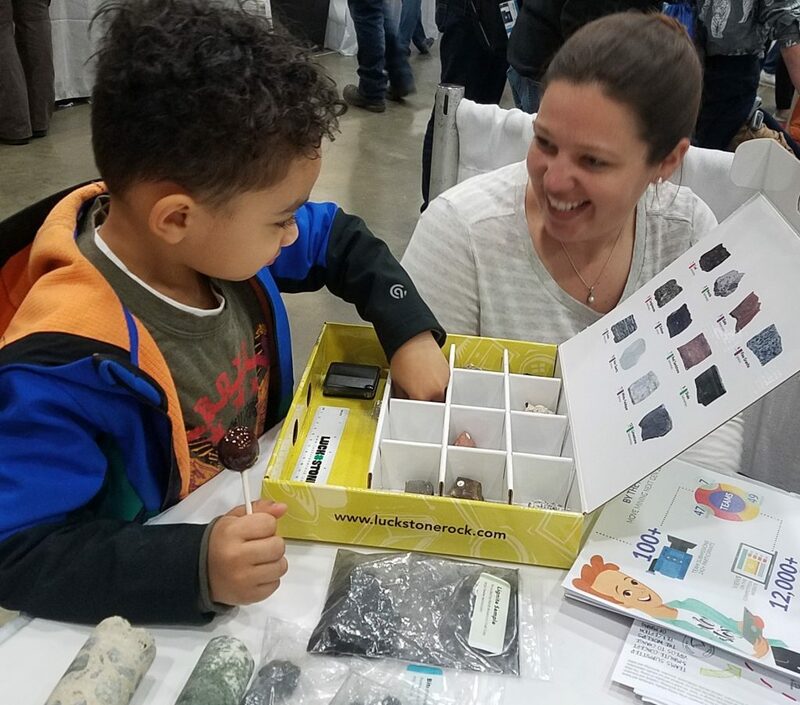 MEC partnered with local SME members and generous mining companies and organizations to provide rock and mineral samples to more than 550 educators at the National Harbor NSTA area conference Nov. 29-Dec. 1, 2018. Volunteer Katie Kosloski, MEC Vice Chair and SME member, chaired the effort, securing rock sample donations and booth volunteers. Luck Stone sponsored the boxes and the printing costs associated with it. They also provided samples and personnel for the booth. Other companies who provided samples include Cargill, Boxley, New Enterprise, the Frazier Quarry, Inc., Glen-Gery, Vulcan, Blaschak Coal Corp and Martin Marietta. While 1,000 kits were assembled by individual teachers, volunteers were available to answer questions about the samples and about all the teacher resources that MEC provides. Thank you to all of our volunteers, Katie Kosloski, John Craynon, “Miner Mike” Kaas, Adam Beissner, Shane Gardner, Dan Sadtler and Levi Simmons. The 2019 National Science Teachers Association area conventions will be held in Salt Lake City, UT (Oct. 24-26), Cincinnati, OH (Nov. 14-16) and Seattle, WA (Dec. 12-14). MEC welcomes the sponsorship of the boxes and printing, box assembly teams, donations of rock and mineral samples, and enthusiastic volunteers to talk with teachers during the event. If you would like more information on how to get involved in this valuable outreach or contribute by way of sponsorship, please contact Tanya Kriss at kriss@smenet.org for more information! K-12 STUDENTS: GET YOUR VIDEOS IN NOW FOR MORE VOTES! Move Mining Next Gen asks K-12 students to answer the question: Why is mining important in our lives? Students can get a team together, research mined minerals that are important to their lives, and then submit their three-minute (or less) video for the opportunity to share their ideas with the world! Videos will be judged by age category, and one video will win the People’s Choice award. 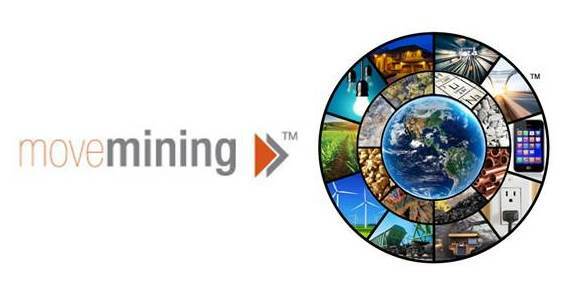 Move Mining Next Gen video submissions are due January 14, 2019. Early submissions have the advantage of more time for online voting! The largest cash prize is $1,000, and there are prizes for different grade categories. All of the details, pointers and parent/guardian consent forms can be found at www.MoveMiningNextGen.org. Check out the big ideas on how to change the world’s perception of mining from 15 teams in five countries! The top five finalist teams will compete to win $5,000 at the live Move Mining event at the SME Annual Conference & Expo on February 25, 2019 in Denver, CO. The session is free to conference registrants and will be streamed live on www.facebook.com/SocietyForMining. Find all of the details at www.MoveMining.org. 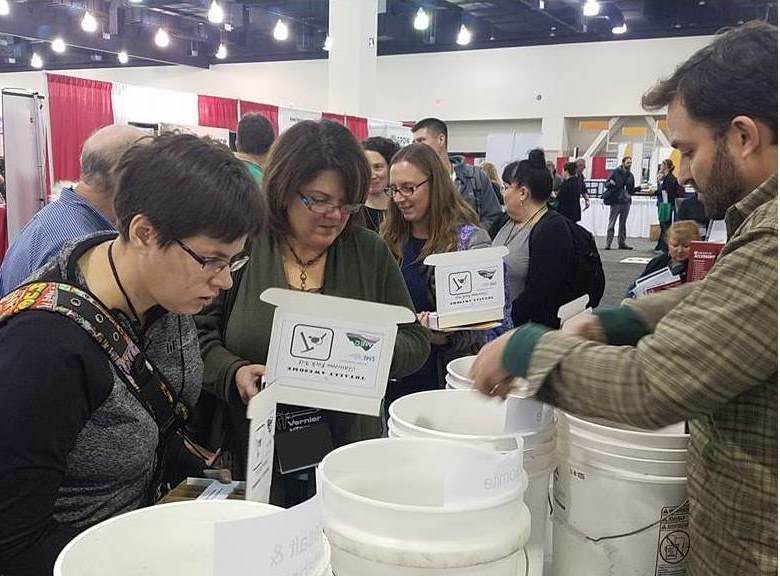 MEC staff and volunteers handed out more than 700 free rock and mineral kits to teachers at the National Science Teachers Association Regional Conference in Reno, NV on October 11-13, 2018. 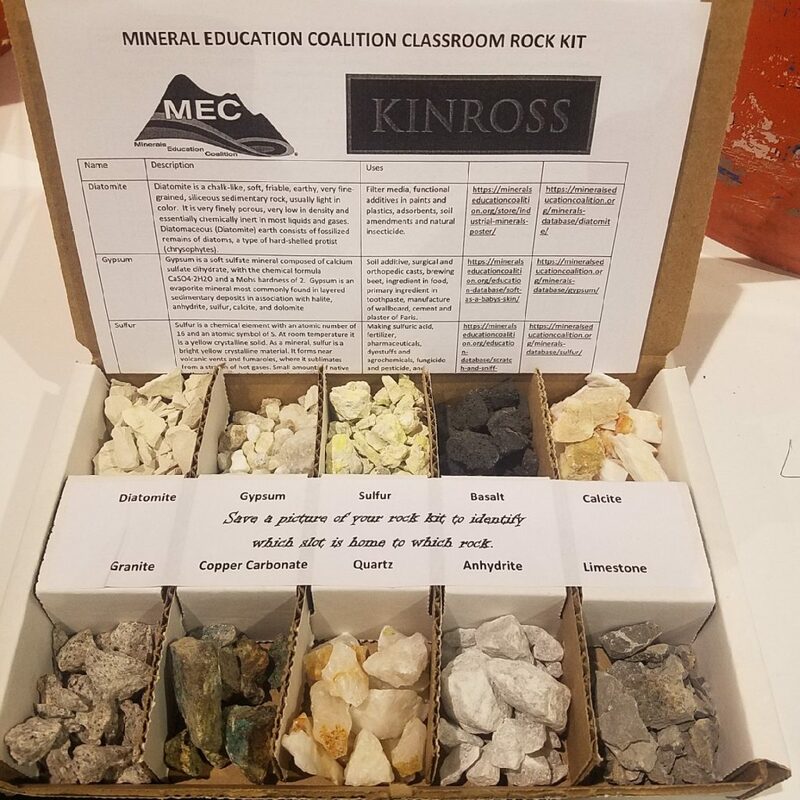 The kit was sponsored by Kinross and made up of ten Nevada rocks and minerals such as basalt, calcite, and copper carbonate donated by mining and mineral companies and NV organizations and associations. SME members and volunteers from Kappes, Cassiday & Associates, Nevada Mining Association, the Geological Society of Nevada and the SME Northern Nevada Section worked with teachers at the booth. MEC is at the NSTA area conference in National Harbor, MD Nov. 15-17 and will be in Charlotte, NC Nov. 29- Dec. 1. Move Mining Next Gen is a companion competition to the original Move Mining competition. Move Mining Next Gen asks K-12 students to answer the question: Why is mining important in our lives? Students can get a team together, research mined minerals that are important to their lives, and then submit their three-minute (or less) video for the opportunity to share their ideas with the world! Videos will be judged by age category, and one video will win the People’s Choice award. Move Mining Next Gen video submissions are due January 14, 2019. Early submissions have the advantage of more time for online voting. The largest cash prize is $1,000, but there are prizes for different grade categories. All of the details, pointers and parent/guardian consent forms can be found at www.MoveMiningNextGen.org. Do you have the big idea on how to change the world’s perception of mining? Don’t miss your chance to win $5,000 for creating the best idea on changing the world’s perception of mining! All video and abstract submissions are due by October 14, 2018. Submit your video now and share it for a chance to win the People’s Choice. Anyone age 10 and up can enter. The top five finalist teams will compete at the live Move Mining event at the SME Annual Conference & Expo on February 25, 2019 in Denver, CO. Find all of the details at www.MoveMining.org. Move Mining has been awarded the 2018 Power of A Silver Award by the American Society of Association Executives (ASAE). According to Chris Vest, ASAE’s Director of Public Policy, “The Power of A Awards recognize a select number of organizations annually that distinguish themselves with innovative, effective and broad-reaching programs and activities that positively impact America and the world.” Move Mining strives to do just that by challenging both industry- and non-industry individuals to consider the importance of mining in their lives and propose ideas for ways to change the public’s perception of mining. 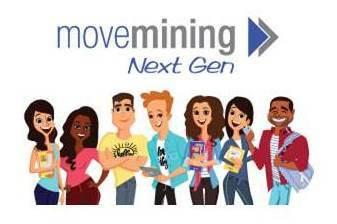 Move Mining Next Gen is its companion competition for Grades k-12. Season 3 of Move Mining is underway, as is the Next Gen competition. Submissions will be posted online at www.MoveMining.org and www.MoveMiningNextGen.org. Visit these websites to learn more about the program. The 21st annual Earth Science Week celebration (October 14-20, 2018) will emphasize artistic expression as a unique, powerful opportunity for geoscience education and understanding in the 21st century. Copies of the “Earth as Inspiration” Earth Science Week Toolkit are free, and available for the cost of shipping and handling in the U.S. To order your Toolkits, please visit www.earthsciweek.org/materials. In collaboration with the Ohio Industrial Minerals & Aggregates Association and Ohio Aglime Council, MEC produced the “From Quarry To Crop” set of resources. The set includes a postcard and a calendar page in the Earth Science Week Toolkit, plus the activities and videos on MEC’s Earth Science Week page. 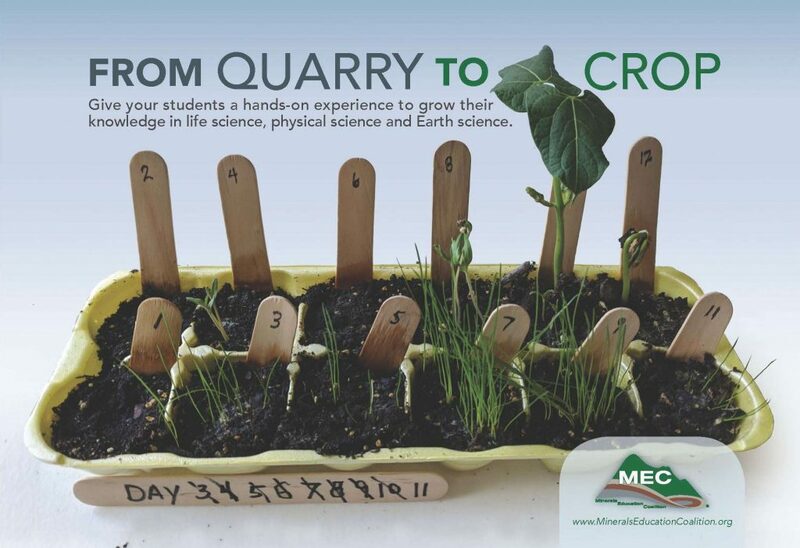 Teachers will find the new “From Quarry to Crop: Growing More With Aglime” hands-on activity for download, along with links to an accompanying step-by-step video and a video all about Aglime, and the “Determining Mineral Reserves” activity calendar page. Volunteer Katie Kosloski facilitates mineral activities with families. MEC participated in the 5th USA Science & Engineering Festival Expo at the Walter E. Washington Convention Center, Washington, D.C., on April 6-8, 2018. The free festival allowed families to participate in thousands of exhibits, experiments and stage shows, drawing more than 350,000 people. MEC offered participants the opportunity to try on mine safety gear and discuss the value of mined materials in their lives. SME members and volunteers at the booth talked with the public about the importance of mining and the exciting careers the industry offers. See the finalists and the winning team present their ideas “Shark-Tank” style in the 2nd annual Move Mining event. View the Move Mining competition on facebook.com/SocietyForMining Monday, February 26, 2018 at 4:30 p.m. Central Standard Time (CST). Move Mining finalists will present at the 2018 SME Annual Conference & Expo in Minneapolis, MN, in a “Shark Tank”-like format. Learn more at www.movemining.org. MEET THE 2017 MOVE MINING NEXT GEN WINNERS! Join us in congratulating this year’s winners of the Move Mining Next Gen K-12 video competition. Also meet the finalists for the Move Mining competition. Be sure to tune in live to facebook.com/SocietyForMining February 26, 2018 at 4:30 pm CST to see the Move Mining event when finalists present at the 2018 SME Annual Conference & Expo in Minneapolis, MN. Learn more at www.movemining.org. 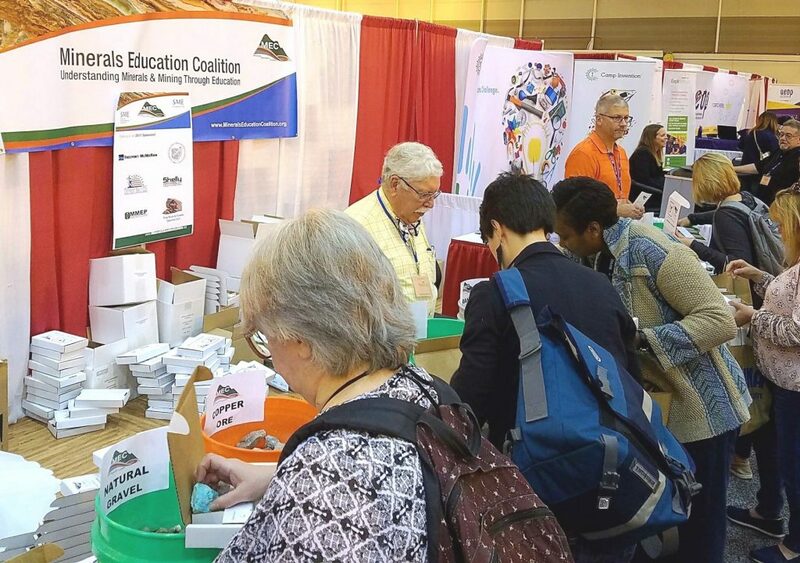 MEC staff and volunteers handed out more than 900 free rock and mineral kits to teachers from 32 states and Canada at the National Science Teachers Association Regional Conference in New Orleans, LA on November 30-December 2, 2017. The “Totally Awesome Classroom Rock Kits” featured samples of ten rocks and minerals such as granite, flint and halite (salt). 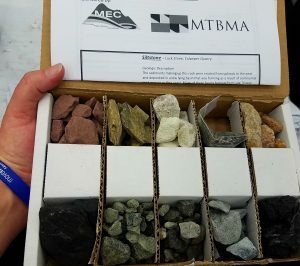 SME members Dale Elifrits and Pat Jacomet led volunteer efforts to develop the rock kits with donations from mining and mineral companies and associations. They also staffed the booth. MEC will attend three NSTA regional conferences again next fall. The 2018 conferences will be in Reno, NV, National Harbor, MD and Charlotte, NC. THERE’S STILL TIME TO VOTE FOR YOUR FAVORITE MOVE MINING NEXT GEN VIDEO! Check out all 100 video entries in the Move Mining Next Gen competition and vote for your favorite! The entries from K-12 students are fun and creative. Voting is open through December 13, 2017. Be sure to also see the video and abstract entries in the second annual Move Mining competition. TIME TO VOTE FOR YOUR FAVORITE MOVE MINING NEXT GEN VIDEO! 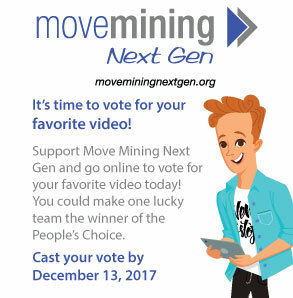 Check out all the videos entries in the Move Mining Next Gen competition and vote for your favorite! Be sure to also learn about the second annual Move Mining competition with entries due December 1. 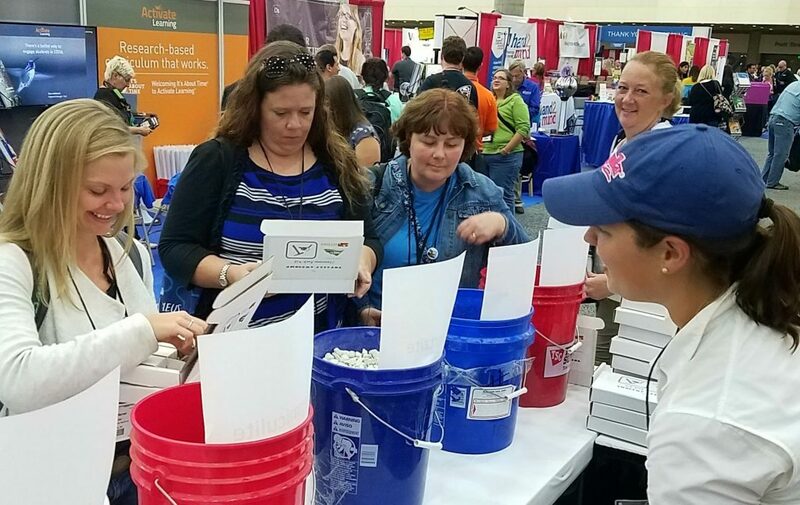 MEC staff and volunteers handed out 1,000 free rock and mineral kits to teachers at the National Science Teachers Association Regional Conference in Milwaukee, WI on November 9-11, 2017. The “Totally Awesome Classroom Rock Kits” featured samples of ten rocks and minerals such as quartzite, sandstone and taconite (iron ore). 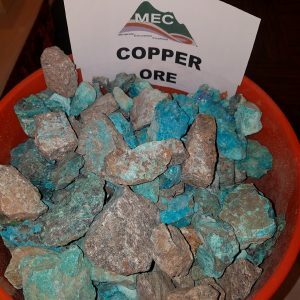 SME member Andrea Martin led the volunteer committee of SME members and collaborating organizations that developed the rock kits with donations from regional mining and mineral companies and associations in the region. The group also staffed the booth. MEC will attend one more NSTA regional conference this fall. and Move Mining Next Gen. Learn all about these competitions and submit your concept and video at the websites for Move Mining and Move Mining Next Gen.
From October 5-7, MEC staff and volunteers handed out 1,000 free rock and mineral kits to teachers at the National Science Teachers Association Regional Conference in Baltimore, MD. 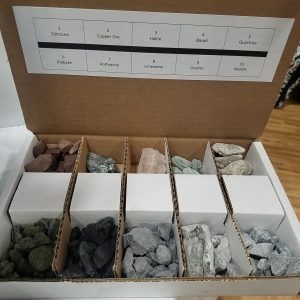 The “Totally Awesome Classroom Rock Kits” featured samples of ten rocks and minerals such as quartzite, siltsone and bituminous coal. Teachers from 26 states attended the booth. 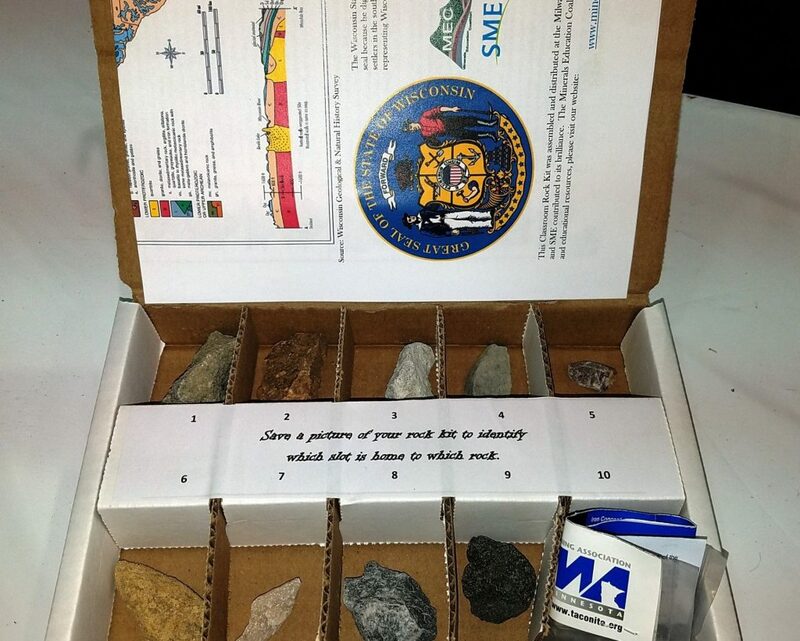 Katie Kosloski of Luck Stone led the volunteer committee of SME members that developed the rock kits with donations from regional mining and mineral companies and associations in the region. The group also staffed the booth. MEC will attend two more NSTA regional conferences this fall. The 2017 Prazen Living Legend of Mining Award will be presented to the Boy Scouts of America (BSA) at the 30th Annual National Mining Hall of Fame Induction Banquet on September 23, 2017, in Denver, CO. The National Mining Hall of Fame and Museum’s Board of Directors made the selection due to the Boy Scouts of America Mining in Society merit badge that was created in collaboration with MEC and SME. 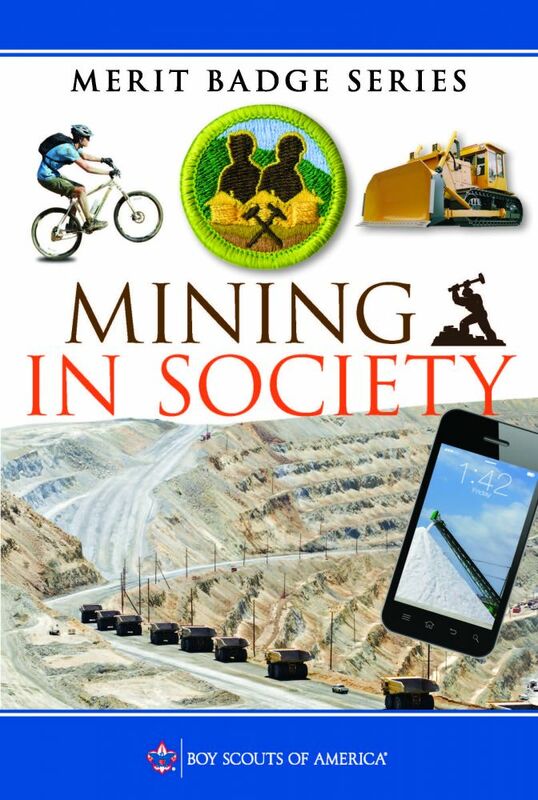 Learn more about the Mining in Society merit badge, including how to become a counselor, on the MEC Mining in Society merit badge page. Why is Mining Important in Our Lives? 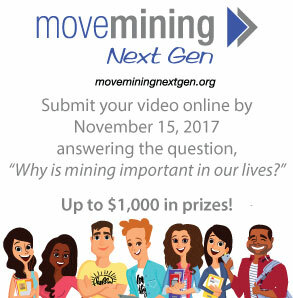 Enter MEC’s new K-12 Move Mining Next Gen video competition and your answer to that question could earn you a cash prize. Videos of 3 minutes or less are due by November 15, 2017. Submit your video early and increase your chances to win the People’s Choice award. Be sure to also find out about the second annual Move Mining competition and its culmination in a “Shark-Tank” style event. Learn about the importance of mining in our everyday lives and come up with your best ideas today! 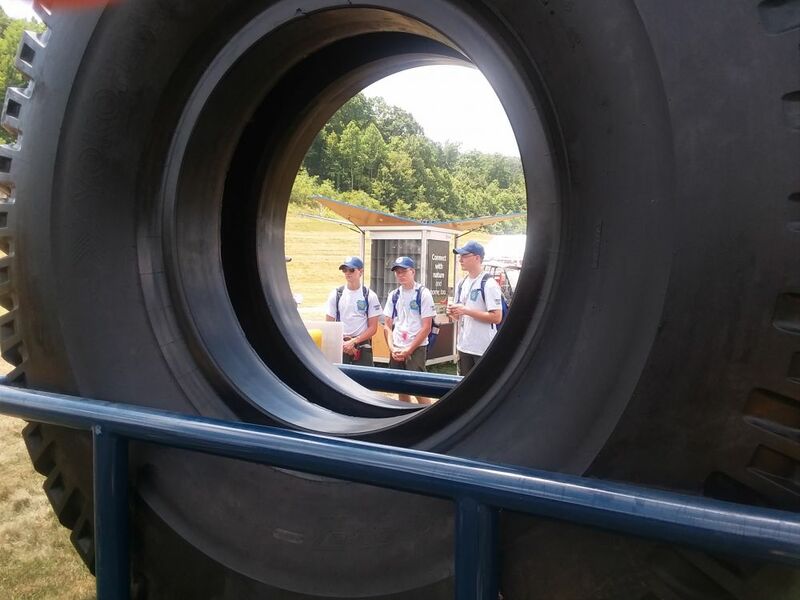 Scouts check out the incredible size of the mining truck tire in a display provided by King Tire Service and Coronado Coal’s Toney Fork mine in Lorado, West Virginia. Attentive Scouts learn about different types of mining equipment. MEC and SME staff and volunteers hosted a Mining in Society merit badge booth at the 2017 National Scout Jamboree at the Summit Bechtel Family National Scout Reserve BSA facilities in West Virginia, July 19-28, 2017. 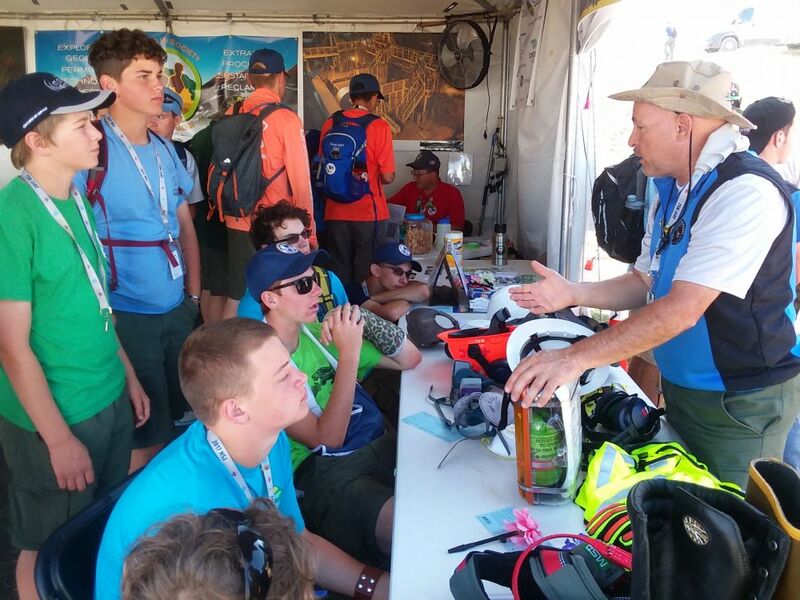 In all, 2270 Scouts visited the booth, and 618 completed the requirements to earn the merit badge during the Jamboree. See more pictures on MEC’s Facebook and Twitter. 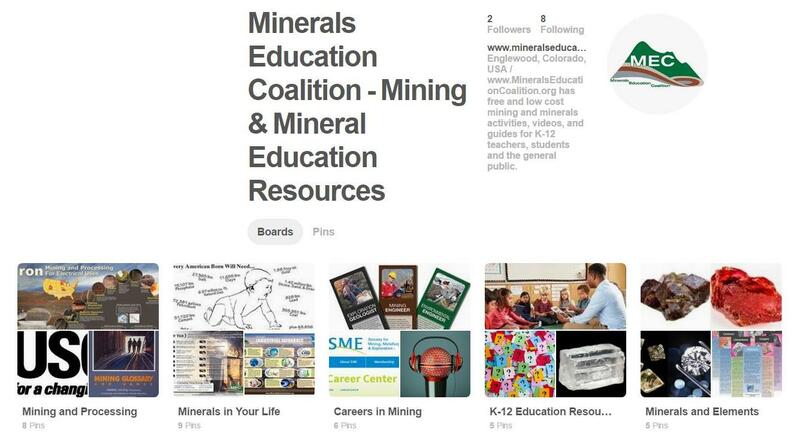 MEC now has a Pinterest page at www.Pinterest.com/MineralsEducationCoalition. Teachers use Pinterest to find activity ideas and other educational resources for their classrooms. Check us out on Pinterest and become a follower! MEC, with SME, is hosting a Mining in Society merit badge booth at the 2017 National Scout Jamboree at the Summit Bechtel Family National Scout Reserve BSA facilities in West Virginia, July 19-28, 2017. Learn more about the Mining in Society merit badge, including how to become a counselor, on the MEC Mining in Society merit badge page. The American Geosciences Institute (AGI) is now accepting advance orders for the Earth Science Week 2017 Toolkit. The Toolkit contains educational materials for all ages that correspond to this year’s event theme, “Earth and Human Activity.” To learn more, please visit www.earthsciweek.org. To order your Toolkits, please visit www.earthsciweek.org/materials. MEC’s new “What’s In My Toothpaste” game will be part of the AGI Earth Science Week Toolkits along with the “A Paste With A Taste” calendar activity adapted with permission from Women in Mining. 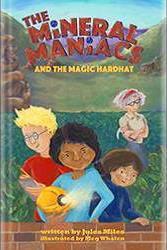 The Mineral Maniacs and the Magic Hard Hat is the first in a children’s book series by Jules Miles exploring the exciting and educational world of mining, geology and engineering. The book was one of the finalists in the 2016 Move Mining Competition. BONUS: Includes a supplemental section for students and educators alike about how the mineral is formed, mined, processed, and used in our everyday life. Available in the SME Bookstore.